AMD has released a quartet of new mobile processors aimed at the professional business market. You will find that these Pro models are almost identical to their similarly named consumer processors but include commercial features such as enterprise level security and enterprise level manageability. As you can see above the trio of 2nd Gen Ryzen Pro mobile processors are all 4C/8T CPU parts which vary with regard to clock speeds on offer, and the number of GPU cores that are to be found in the accompanying Vega graphics portion of the APU. Interestingly AMD has seen fit to create a 'Pro' version of its budget Athlon 300U, dubbed the AMD Athlon Pro 300U Mobile Processor with Radeon Vega 3 Graphics, to give it its full title. 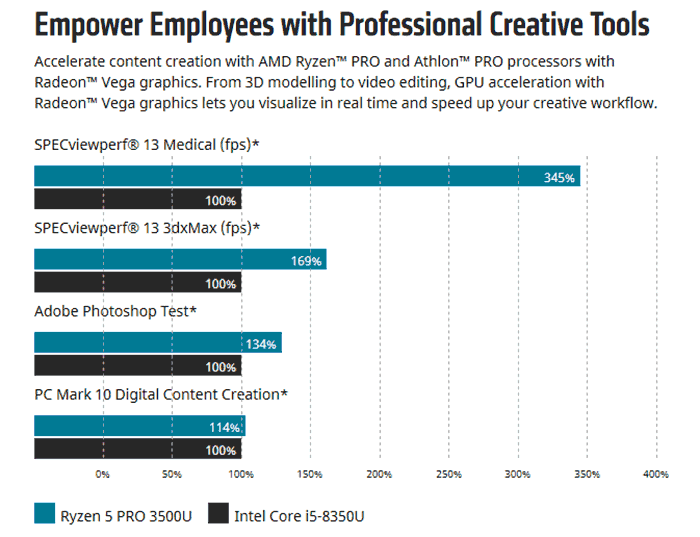 On the 2nd Gen Ryzen Pro mobile processors product pages AMD has highlighted the performance of its new Ryzen 5 PRO 3500U as compared to the Intel Core i5-8350U as evidence of its superiority (see above). Commercial systems from HP and Lenovo, packing the above new mobile processors, are expected to debut this quarter. AMD says other OEMs are expected to offer machines with this processor lineup later in the year. So Zen2 based CPUs arent going to be Ryzen 3xxx chips then? Or they going to try and confuse people by calling them the same range number as Zen+ mobile parts? Kanoe - they did this with the 2xxx series too. The first gen integrated graphics models had 2xxx branding, as did the pro models. This is pure marketing to avoid “late gen” parts being made to look “old hat” by new releases scheduled immediately after. Also, for consumer parts they may require BIOS updates in line with the next gen parts (as the integrated graphics models did) which means that in terms of motherboard/hardware support, they fall closer with the newer parts in terms of compatibility. It is very confusing, though, and doesn't do any favours. That being said, Intel's currently in a mess with 8xxx and 9xxx parts flowing around, and still a surprising number of 7xxx parts in the channel. Yesterday my two choices for a customer laptop were an i7-8xxx with GTX1050 or a i5-7xxx with GTX1060 for 200ukp more! They do a generational lag because it takes time for the full design and validation of the PRO line to be selectable in corporate environments. Basically they can sell these CPUs as a rubber stamp stable and good to go. Intel kinda does this because for corporate devices it's not often that a system designed for longevity and security is the latest generation. No mention of ECC ram ability. It'll likely be down to mobo to support but there will be no validation like pro gen1. All ryzen has ecc capability, its just not validated.